Although gold and silver still took center stage in the 18th and 19th century monetary world, copper coins were dear to the colonial experience. Since well before the American Revolution, small coppers minted by official and unofficial sources circulated virtually everywhere in the Thirteen Colonies. The large number and variety of colonial coppers attest to how needed these coins were for common everyday transactions. When the United States Mint was established, the first regular issue coins minted were the copper cent and half cent. 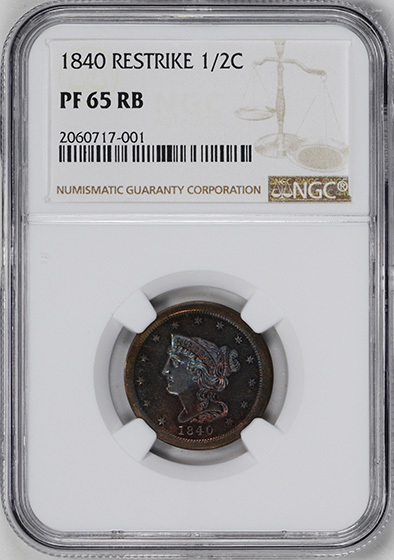 When the Mint began making copper coins in 1793, they were still competing with private coin issuers. Mint record show that 1,076 pounds of Talbot, Allum & Lee 1795 cent tokens (about 52,000 tokens) were purchased in April of 1795 and were cut down to make half cents. As more coins became available for the stream of commerce, the lowly half cent ceased to have meaning as a medium of exchange. The coins of choice were the vast numbers of Spanish reales that circulated freely in the pre-Civil War United States. 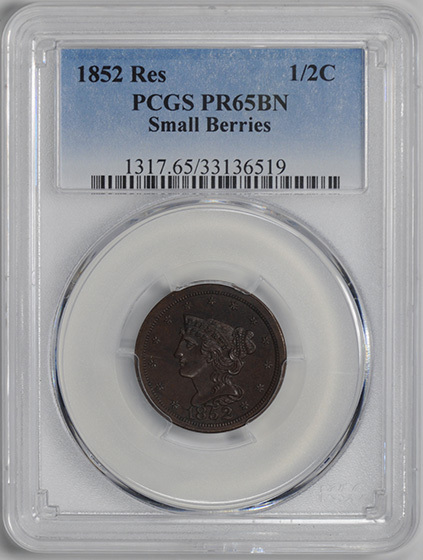 Half cents were minted only sporadically after 1811. An order from the merchant Washington Cilley was responsible for re-establishing production of the coin in 1831, though that year’s mintage was very small, about 2,200 pieces. Production peaked in 1835 but ceased the following year, after lack of orders for the denomination caused Mint Director Robert M. Patterson to wait until the large quantity stored in Mint vaults could be distributed. It was the custom in this era to give visiting dignitaries gifts of proof sets of United States coins. 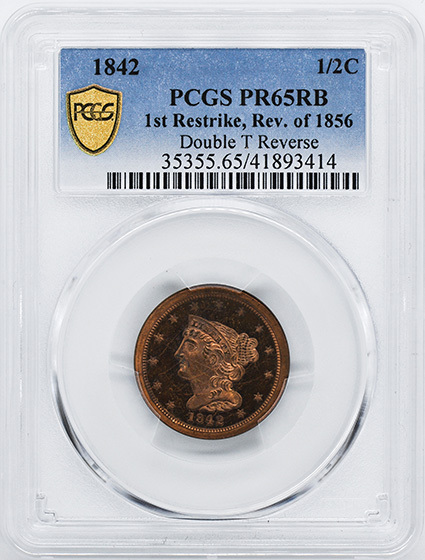 In 1840, Patterson decided to include the half cent in the proof sets and instructed Mint engraver Christian Gobrecht to create dies for this purpose. He also directed him to complete hubs from which working dies could be made in case the need for half cents returned. Gobrecht used the same Braided Hair design he had used on his cent of 1839. The new Miss Liberty replaced John Reich’s matronly “Classic Head” used from 1809 to 1829 and again, with some modifications by William Kneass, from 1831 through 1836. The Gobrecht Braided Hair is a simple design that gives dignity to this lowest coin denomination. A bust of Liberty, her hair braided into a bun in the back of her head, ringlets of hair draping down below the base of the bust, faces left. She is wearing a tiara in which the word LIBERTY is inscribed. Thirteen stars surround her head in a semicircle. The reverse continued the design introduced on John Reich’s half cent of 1809 and used with minor changes throughout the history of this coin. The denomination HALF CENT is framed in a wreath tied at the bottom with a bow, surrounded by the legend UNITED STATES OF AMERICA. 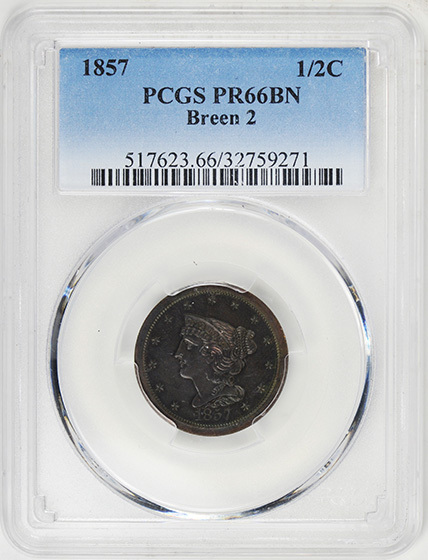 Braided Hair half cents of 1840 to 1849 were made only as proofs and were used for diplomatic presentation sets or sold to well-connected collectors. Orders for business strikes numbered only about 16,000 pieces per year, and the Mint met demand from stocks on hand. As late as 1848 there were still 82,000 half cents remaining in the Mint’s vaults from the 1834 and 1835 mintages. In 1849, with supplies dwindling, small orders for half cents were received by the Mint, and production of the coin began again. The orders were probably stimulated by the growing shortage of silver coins that were being withdrawn from circulation due to the rising price of silver. Except for a hiatus in production in 1852, when sufficient quantities of the coin were again on hand, minting continued until 1857 when the denomination was finally discontinued. After 1850, most production went to post offices where they were used for making change. 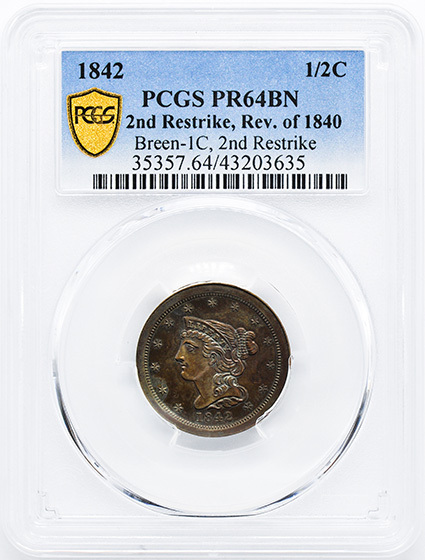 Collecting coins became a popular hobby in the 1850s, and it became irresistible to some mint employees to get out the old dies and “restrike” the proof issues for the growing army of paying collectors. These were sold surreptitiously by Theodore Eckfeldt, the Mint’s night watchman, through a Philadelphia store owned by a Dr. M. W. Dickeson and later through coin dealer William Idler. Mint Director James Ross Snowden discovered this scam and sealed the dies away in the mint vault in July of 1860. Eight years later, the then Mint Director Henry R. Linderman opened the cartons and struck some additional pieces before finally destroying the dies. There were ten years of proofs before business strikes even began. This is unique in the history of United States coinage, making this an interesting but expensive area to collect. 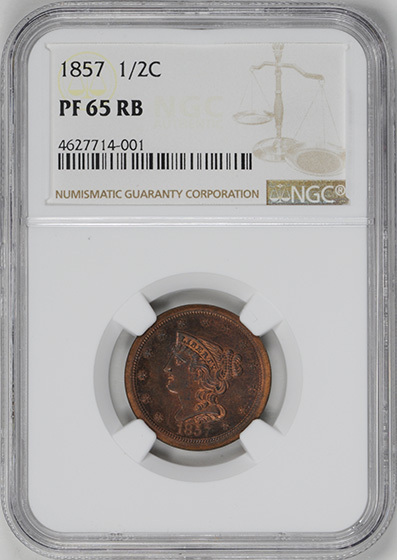 Although scarce, nearly all the proof dates appear in the numismatic marketplace at one time or another, though some varieties are extremely rare. “Restrikes” are easy to identify. The originals have large berries in the wreath, and the restrikes have small berries. Though the exact mintage is impossible to determine, it has been estimated by various sources that there were fewer than fifteen hundred proofs minted in all years, including the proofs and restrikes of 1852. The business strikes present another kind of collecting challenge. Only 544,510 coins were minted. Although every date is available in uncirculated and circulated grades, finding original red mint state pieces is difficult. “Hoard” dates such as those of 1851, 1854, 1855, and 1857 appear occasionally, but most seem to suffer from the black spotting that detracts from the eye-appeal of copper coins. Brown or Red-Brown uncirculated coins are more commonly found. Beware of coins dipped in cyanide to simulate pristine coins. 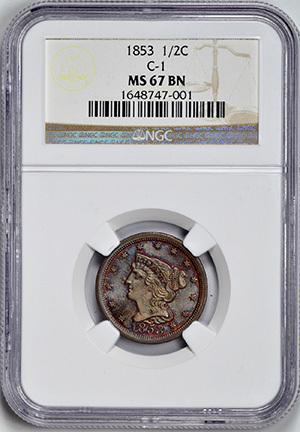 When grading Braided Hair half cents note that mint state coins usually have some blemishes. Copper is a chemically active metal and, depending on the storage environment, can suffer from carbon spots and corrosion marks. These imperfections must be considered when grading. Look for wear spots first on Liberty’s hair just to the right of her ear and on the hair curls on the lower part of her neck and below the bust. On the reverse, check for traces of wear on the laurel wreath at nine o’clock and three o’clock and on the bow. 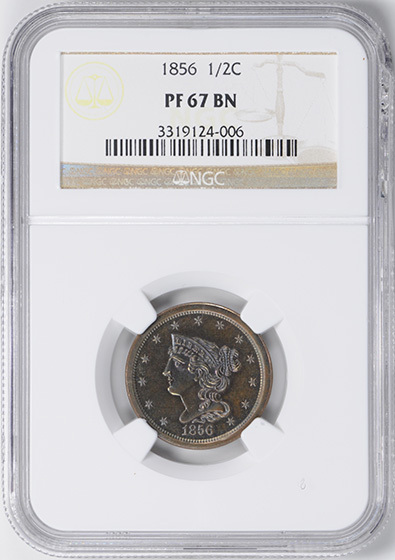 The half cent as a denomination died in 1857 but was almost revived by Congress in 1912. Ohio Representative Bulkley, on the advice of Treasury Secretary Franklin MacVeagh, introduced a bill that would have created a new half cent and three-cent piece. It passed the House on May 6, 1912 but never passed the Senate, ending forever the half cent denomination.